Moto's game arcades carry three names: Full Hou$e, Lucky Coin and &Play. 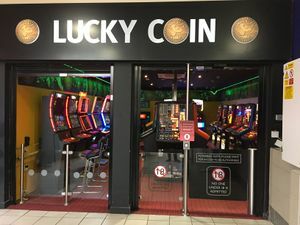 Between them, there are arcade games and gambling machines, with prizes of up to £500-£1000. Recently, Lucky Coin has been scaled back in favour of the other two. Prior to this, the name GScape was used. This was created by Granada, but continued in to the Moto era, with the one at Severn View lasting a further 10 years.